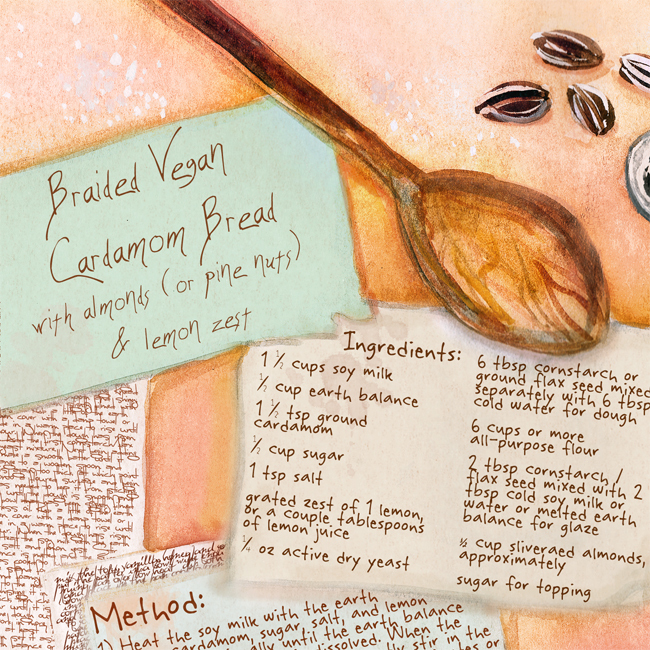 I made this illustrated Cardamom Bread recipe for They Draw and Cook, but I couldn't get the text large enough for the scale of the website. 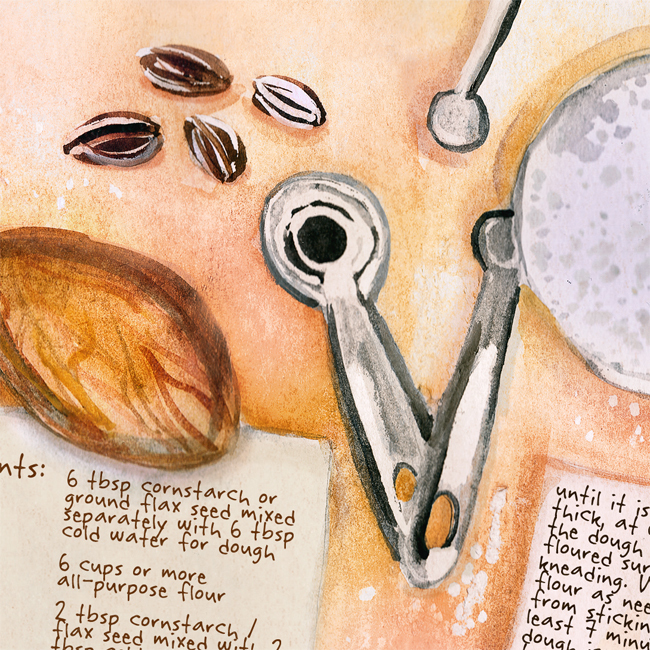 When I was making this drawing I didn't realize quite how lengthy this recipe is! I'm incredibly happy with the drawing itself, though. 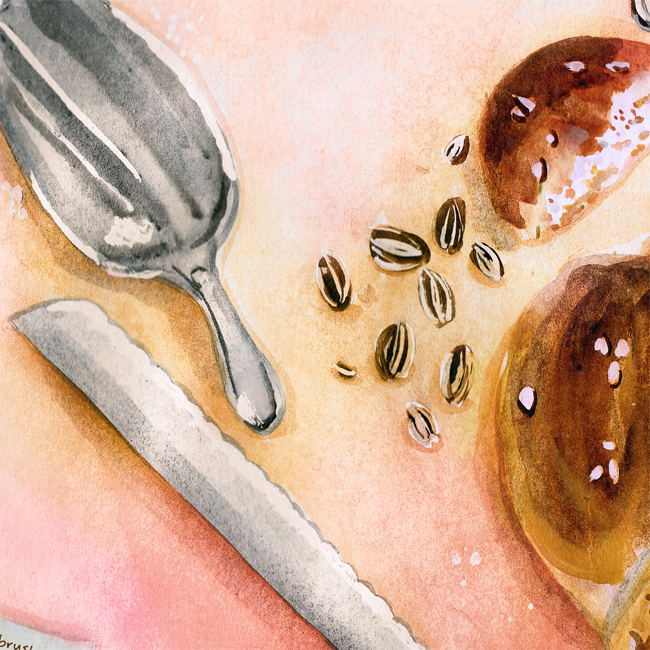 The original is watercolor with gouache accents, 30"x11". The text is digital, and I changed the color heavily in the computer as well. Below is the recipe typed out, followed by details of the full-size version. This is based on a recipe by Deborah Madison, though I've changed it and veganized it. It's gorgeous and delicious braided in 3 strands or 6. It's a great holiday bread or breakfast - soooo good just topped with earth balance, cinnamon, and sugar. And and leftover slices make AMAZING vegan french toast, I can't even tell you. If you're not vegan, you will still enjoy this bread! If you're still skeptical though, you could use butter instead of earth balance, dairy instead of soy milk, and 1 egg in place of each of the cornstarch / flax seed mixtures. For vegans, I just said "soy milk" because it's what I've used in the past. Both vanilla and plain work, I can't tell much of a difference, though if you're sensitive to sugar you might want to decrease the sugar topping if you using vanilla. I'm sure it would be great with almond or other nondairy milk if you prefer, though I haven't tried it. It would get even more dessert-y with coconut milk - if you try that let me know how it turns out! 1) Heat the soy milk with the earth balance, cardamom, sugar, salt, and lemon zest. Stir occasionally until the earth balance is melted and the sugar is dissolved. When the mixture has cooled to lukewarm, gently stir in the yeast and let the mixture stand for 10 minutes or until the yeast is nice and foamy. 2) Begin adding the flour, whisking it in to make a smooth batter until it becomes too thick; then change to a wooden spoon. Continue adding flour until it is again too thick, at which point turn the dough out onto a floured surface and begin kneading. Work in more flour as needed to keep it from sticking. Knead for at least 7 minutes, until the dough is smooth and shiny; then set it aside in a bowl that has been slightly filmed with earth balance or flavorless oil. Rub a little of the earth balance on the top; then cover with a damp towel and set it aside in a warm place to rise until doubled in bulk, about 1 hour. When the dough has risen, turn it out onto the counter. 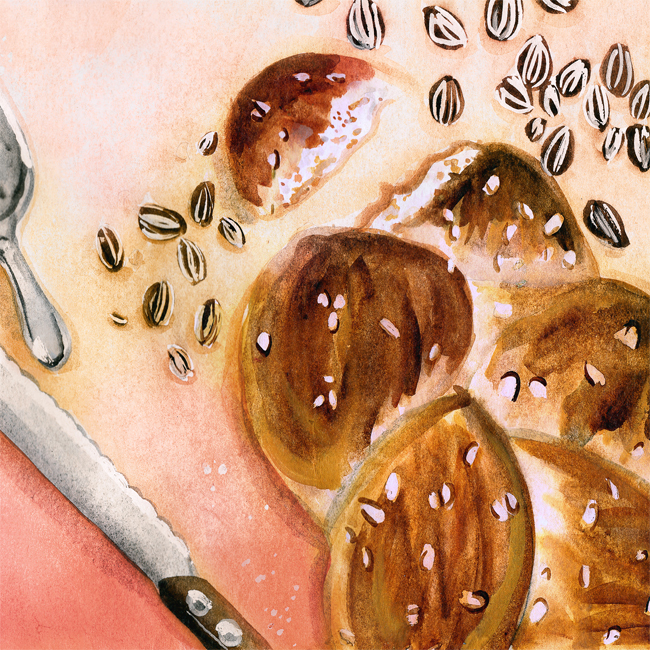 3) Braid into one big loaf. Glaze with the second cornstarch / flax seed mixture, press in the pine nuts or almond slivers, and sprinkle the surface with the sugar. Loosely cover the bread and set aside again to rise until again doubled in bulk, about 45 minutes. 4) While the bread is rising, preheat the oven to 350F. Just before putting it in the oven, brush more glaze over areas exposed by the rising of the bread and cover them with more toppings. 5) Bake the bread until is a deep golden brown on top, about 40-45 minutes. Allow to cool before eating. 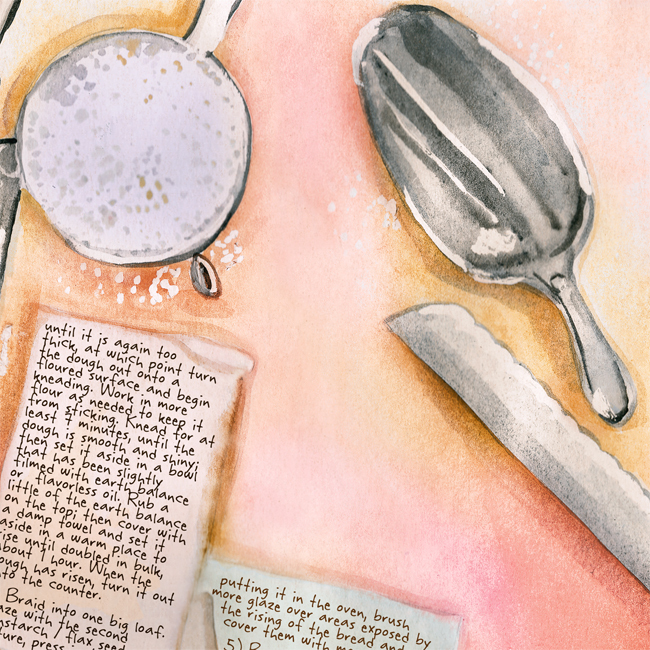 These illustrated recipes are wonderful, Naomi!